Call them dumplings. Call them Polish pot stickers. Call them whatever you like. Pierogies are just plain delicious, and kids have a blast making them. This is the first time we’ve attempted a stuffed dumpling in our food appreciation classes and pierogies–a huge favorite in Eastern Europe–do take a bit of practice. The trick is getting just the right amount of stuffing onto a circle of pasta dough so that when you fold the dough closed, the stuffing doesn’t ooze out the edges. Then you have to pinch the edge several times all around to make sure the dumpling doesn’t open up when you boil it and spill its contents into the water. Otherwise, there’s nothing terribly complicated about making the components for pierogies: along with a pasta dough much as you would use for Italian pasta, there’s a stuffing, in this case a very traditional potato and cheese mix. 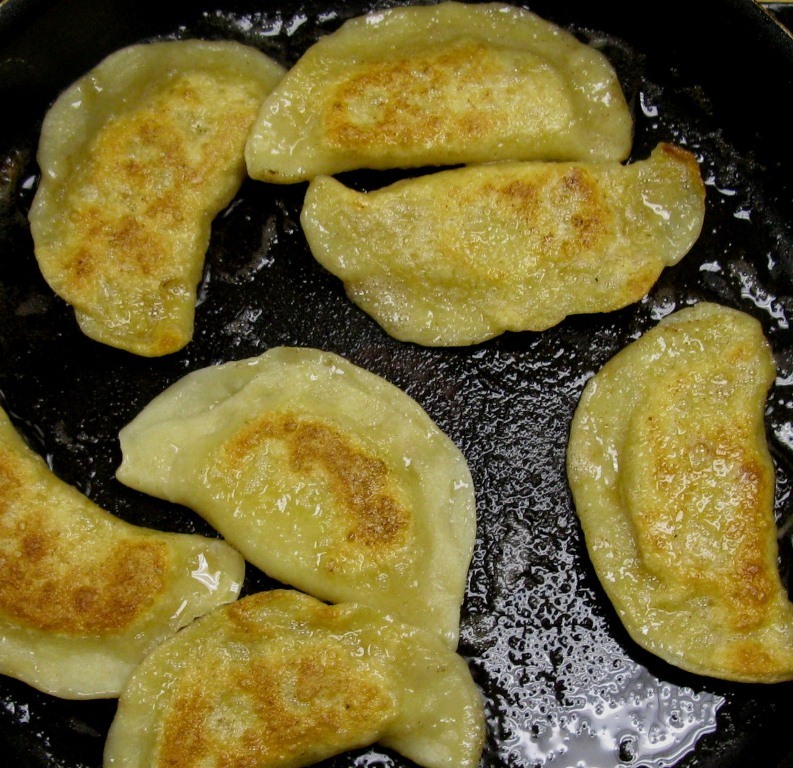 Pierogies can also be filled with sauerkraut, mushrooms or other savory items. 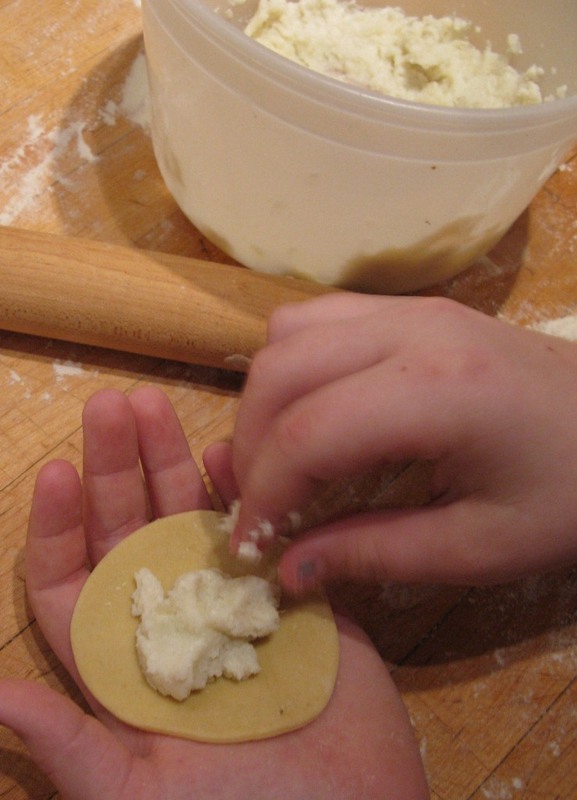 We chose to roll our dough flat with a rolling pin, but if you have a pasta machine, you might want to use it instead. Eventually, you want your dough to be on the thin side of 1/8 inch. A thinner dough makes more delectable pierogies–plus the thinner you roll the dough, the more pierogies you’ll have. Start by making your dough. You’ll want it to rest an hour or even overnight before using. In a large mixing bowl, mix together 2 cups all-purpose flour and 1/2 teaspoon salt. In a separate bowl, beat 1 large egg, then whisk in 1/2 cup water. Add the egg mix to the flour and mix thoroughly. If it’s too sticky at this point, add more flour. Use your hands to shape the dough into a ball, then pour it out onto a floured work surface and knead the dough about five minutes, or until it is smooth and elastic. Cover with plastic and allow to rest. While the dough is resting, peel 1 large Russet potato and cut it into 1-inch dice. Cook the potato in a large kettle of salted water. (This will later become your water for cooking the pierogies.) When the potato is cooked through and soft, remove it from the water and drain in a colander. Place the potato in a mixing bowl and mash thoroughly. When it is cool enough to handle, add a like amount of farmer’s cheese (or substitute cottage cheese or ricotta) and mix thoroughly with your hands. On a floured work surface (or in your pasta machine), roll the dough to a thickness of 1/8 inch or even a bit less. As you’re rolling the dough, you might want to flip it over from time to time and dust it with flour to make sure it doesn’t stick to your work surface. When you have finished rolling it, cut the dough into circles with a 3-inch biscuit cutter. 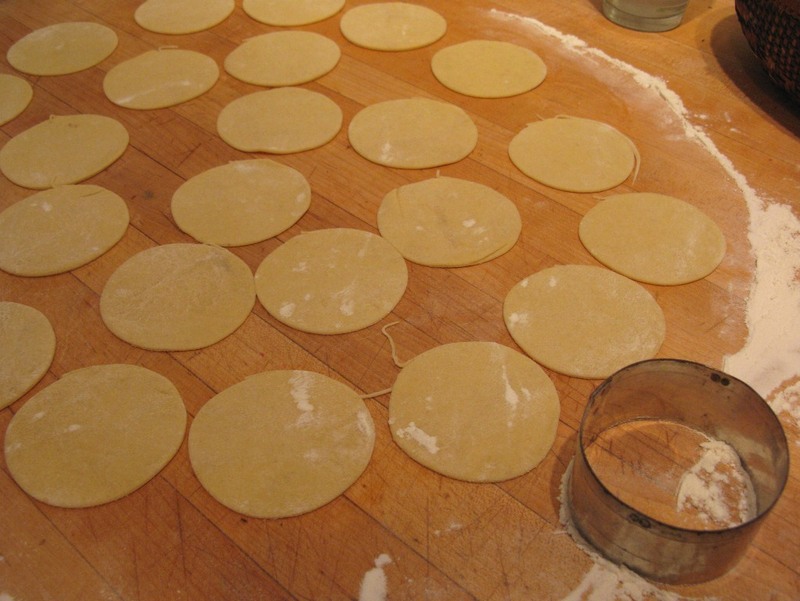 Save the scraps–they can be rolled again to make a few more pierogies. You should end up with about 30 in all. Use your hands or a mechanical scoop to place a small ball of filling on one of the discs of dough. 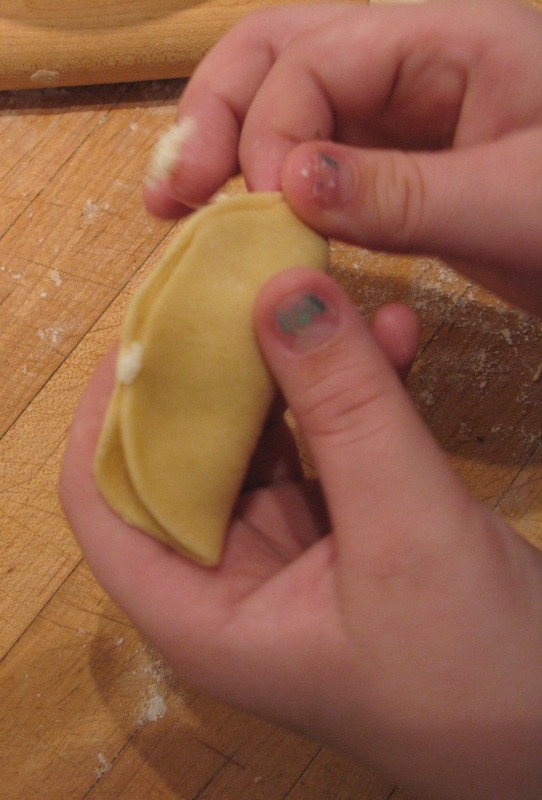 Holding the disc in one hand, use the thumb of the other hand to press the dough into place as you fold the disc in half to close the dumpling, making a half-circle. The trick at this point is not getting any of the filling onto the edges of the pasta disc, which means practicing a bit until you get a feel for how much filling each dumpling requires and carefully pressing the filling with the side of your thumb into the crease as you close the dumpling. Once you have your pierogies assembled, you can cook them in the same kettle of salted water you used for cooking the potatoes. Use a large amount of salted water for this. It should be at a rolling boil before you add the pierogies. Cook them in batches, perhaps 10 at a time. After you’ve added the pierogies to the water, give them a stir to make sure they don’t stick to the bottom of the pot. Make sure the water returns to a boil. The dumplings will be done in about three minutes, when they are all floating at the surface. Use a slotted spoon or other tool to drain the dumplings well as you remove them from the pot and place them on a sheet pan to cool. You can hold the pierogies for several hours after they’ve boiled. Just cover them with plastic. (They could also be frozen before boiling for use later). The final step, just before serving, is to fry the pierogies to a delicate crispness in butter. Again, do this in batches using plenty of butter (at least 2 tablespoons) in a heavy skillet or saute pan over moderately high heat. You don’t want to burn the butter or the pierogies. When the dumplings are lightly browned on one side, flip them over and brown the other. Serve with plenty of sour cream, either as an appetizer or as a side dish with your favorite Polish sausage and sauerkraut. Pierogies are not the easiest assignment for an elementary school cooking class. But the kids in my classes really impressed me with how well they followed each of the steps. They did a great job folding the dumplings. And of course they were crazy about the final result. They were dying for seconds. I made a double batch of these pierogies on Easter Sunday. Fun for adults too, and this recipe was a hit! Thanks for sharing!